The name does not evoke an image of an Italian restaurant. Turquoise-vinyl-booths, vintage coat-racks and well-worn bar-wood suggest a place in time, long past. The owners have preserved the post-war ambience without fault (only TVs and contemporary beer signs unmask the era.) What was old is new again. Without the well-used flooring, ceiling and everything in between, the interior would look like something designers are striving for in 2010, at considerable cost and effort. The Bonnie Brae Tavern is, however, unmistakably old. PIZZA is the signature food at the Bonnie Brae Tavern. The thin, “dry-er” crust is – for sure – the crust of a Colorado Pizza. The traditional (rich and tangy) pizza sauce is covered with traditional cheeses and toppings. This is not New York style pizza, but it is a tasty alternative. I’m treading carefully here. Many Denverites are as proud of their Colorado-style pizza as New Yorkers are of theirs. 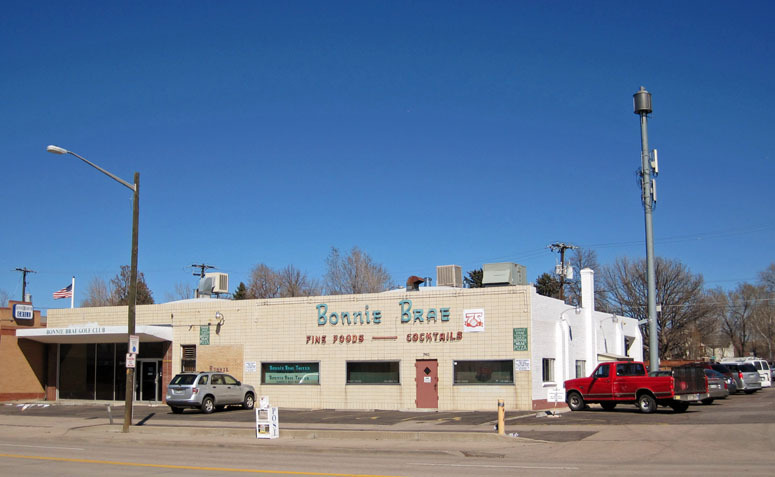 Before NY Pizza came to town, the Bonnie Brae was one of the more popular pizza joints in Denver. Italian dishes: Spaghetti and Meatballs/Sausage with a rich, red sauce is served with soup or salad and bread and butter ($9.00.) Also Vegetable Primavera ($9.00) W/Chicken ($11.00.) A la carte servings of Spaghetti are also offered. Old school spaghetti is what it is. The old menu offered more Italian dishes like Lasagna and Ravioli. (I would be less than honest if I didn’t say that I am disappointed that there are fewer Italian entrees on the menu.) Oh well – for South-Denverites – it’s all about the pizza here anyway. Dinner Entrees, such as: Steak – 8 oz. Ribeye w/two sides ($12.95,) Baked Ham, Pot Roast and Hamburger Steak are on the menu, as well as Salads and Soups. Nightly Specials are offered – call or check the website. The Bonnie Brae Tavern has remained basically unchanged since the mid 1950s. It is somewhat analogous to a classic automobile. Hopefully it will be preserved. Before dinner one night, I ordered a *Moscow Mule just to see if they would know it. To my surprise, the bartender made me one (I had been trying to find one for weeks.) This is a good place. Bonnie Brae Tavern’s Official Website with full menu, photos, history and more. *Moscow Mule is a drink popularized during the “Sputnik Craze” of the 50s, consisting of Vodka, Ginger Beer and Lime juice, properly served in a frosted, copper mug (it kicks like a mule and speaks Russian). BONNIE BRAE TAVERN is a TrueItalianTable recommended authentic Italian restaurant.